The 6 types of parents who visit Santa's photo booth. 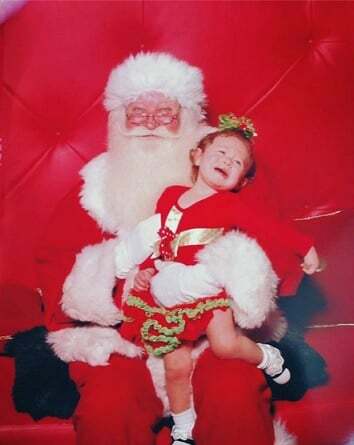 High decibel screaming, snot flying through the air, tantrums, hyperventilation and sheer terror…Meet the kids sitting on Santa’s knee – and the parents who put them there. 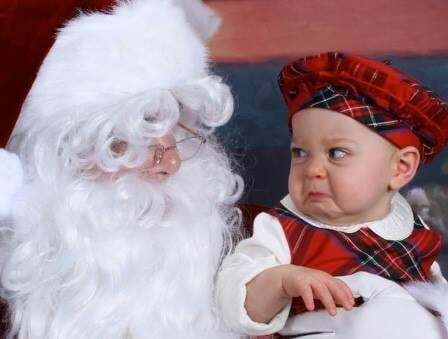 Most kids arrive to visit Santa with pure elation smeared across their faces as they recite exactly what they’re going to ask him for Christmas. But as they step closer to the big, fat, jolly man – they change. First they’re stunned. Another step closer and most kids are gone. Done. See ya later Santa Claus – I’ll have coal for Christmas – gone. This week, child protection activist Hetty Johnston called for children to be banned from sitting on Santa’s lap. Her call came after Queensland parents and activists took to social media to express their concerns about the safety of the annual tradition. Johnston says children should never feel pressured to sit on Santa’s knee because they have a right to feel safe. And being a former Santa photographer myself, I kind of agree with her sentiment. I don’t agree with banning the tradition completely, but I agree that we should be giving our kids a choice. Let them decide if they want to sit on the Strange Man’s knee. In my time I have seen it all – parents at their best and parents at their absolute worst. So I’ve compiled a list of the six types of parents that you’ll find at the Santa photo booth. 1. The drop and run parent. This is the type of parent that will sit on Santa’s knee under their screaming, petrified child. 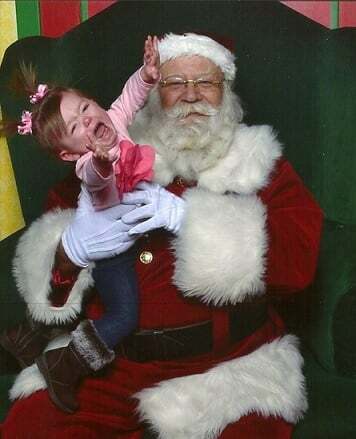 Then just as said child is starting to calm down they will throw the baby into Santa’s other arm, do a dash off camera and yell at the photographer to SHOOT – TAKE THE PHOTO, while the baby has begun screeching again. Result: A lot of loud noises and a very confused looking Santa Claus. These parents think that dance is the key to happiness. They will sit their baby or child on Santa’s knee, and when their child stares blankly at the camera these parents take cue. Amazing warped dance moves commence – but sadly, no smile from baby. There are plenty of smiles from me though – I wish I’d had a playlist for these parents, because the silent interpretive dance is next level. Result: Confused and stunned child – wondering what the heck mum and dad are doing. 3. The full on denier. “My child will sit perfectly and smile perfectly (even though they came out of my womb a week ago)” – I imagine this is what goes through the head of denier parents. These parents will insist on taking at least 56 photos of their blank faced – or screaming – newborn while attempting to capture the perfect photo. They use every squeaky toy, run up to their baby, say ‘boo’ and run back. They’ll sing, they’ll dance, they’ll try and take over the camera. These parents have no shame. The denier will do anything. Once I had a parent grab Santa and their child to start dancing to Jingle Bells in a trio waltz – it didn’t work out so well. Result: Loss of dignity for parent. Result: Hilarious photos of screaming children. These parents think that if they disappear from the situation the child will be so much happier. Because of course, if you’re scared being in a room surrounded by strangers while sitting on a big red man’s knee, the best thing to do is have the only person you recognise run and hide. It’s like a bigger version of peek-a-boo, where the parent will sit their child on Santa’s knee before running behind the nativity scene, leaving a petrified child in the spotlight. This parent is willing to be in the photo – but often it doesn’t make the child any less scared. The parent will join the photo, sit on Santa’s knee and hold their screaming child. They’ll clutch the child who is often trying to escape. Some parents will be clawed by their child but will stay sitting and smiling at the camera while their child trembles in fear. Result: An awkwardly smiling parent clutching their screaming child who is trying to escape. What’s your funniest Santa photo story? Don&apos;t look too happy, child It&apos;s only the strange man who delivers you presents once a year. Even the mistletoe on this child&apos;s head doesn&apos;t make this photo happy. 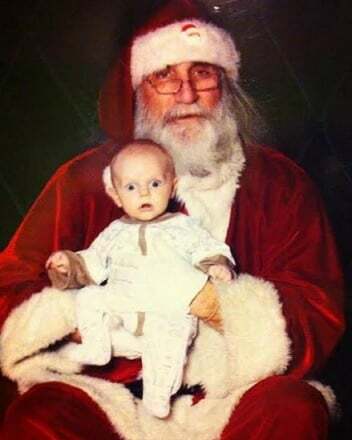 The child and Santa look equally glad to be together. How do Santa&apos;s eyes even get that big? Run, child, run! That Santa would make me flee, as well. A real contrast of emotion depicted in this image, from utter fear, to mild happiness and ending with utter boredom. Perfect. This must be the worst Santa ever seen. Santa, you had one job: keep your beard on. I can see who made the nice list. Oh, my goodness. Let that child get off Santa. Too much unhappiness for Christmas.